9 20 min exposures. Astrodon 6nm FWHM 92%T H-a filter and 6 30 min exposures from Astrodon SII and OIII filters. North is up and the FOV is approx 30 x 25 arcmin. Hubble Color Pallete: R=SII, G=H-a, B=OIII. 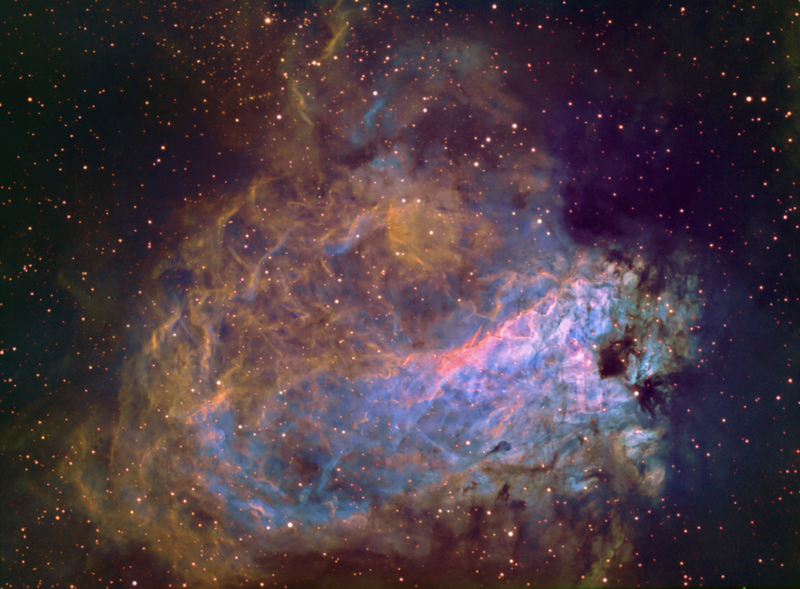 Rob Gendler has an excellent description of M17 at http://www.robgendlerastropics.com/M17text.html. This region is only 5000 light years distant and represents a huge HII, molecular cloud and star-forming region that is a strong radio souce. You can see a "horseshoe shape" closed on the left and opening toward the right that was carved out by UV flux of hot stars, according to Rob’s write-up. This is accentuated by the tricolor narrowband method that enhances structural contrast.